Water damage problems can’t wait! 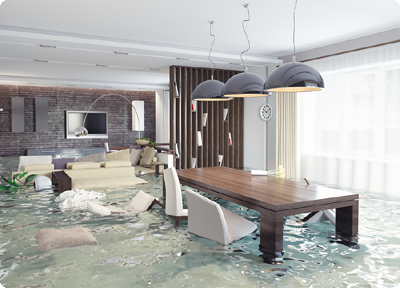 If left untreated, water can pose a serious threat to furnishings, walls, floors and ceilings. We have the equipment and trained personnel you need to mitigate your loss whether it’s flooding in a residence or commercial business. Sewage and flood waters contain bacteria and other micro-organisms which are very harmful to human health. These micro-organisms can te transmitted by touching contaminated items or by tracking them into other areas by shoes. Keep all pets & children away from contaminated areas. This would usually be from a break in the water supply line in your house. It could also come from the groundwater leaking in from the outside, usually during a rainstorm. There would not be any concentrated amount of bacteria in this type of water. It can come from a rainstorm but would include types of bacteria that would try to culture during the wet period. A toilet overflow would not result in this type of water. Black water is from a sewer backup and usually contains a high amount of harmful bacteria. This is the most severe water backup and should be dealt with by a professional who has the training and the proper equipment. Call Sparkling Clean Carpet Care at 419-475-6556!